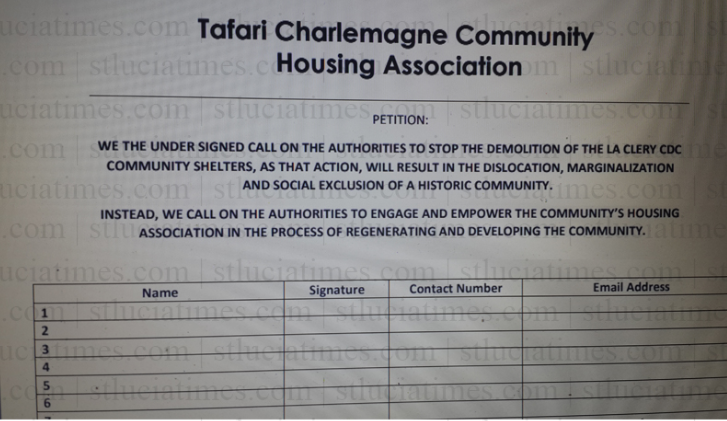 A new association called the ‘Tafari Charlemagne Community Housing Association’ is calling on the authorities to stop the demolition of CDC community shelters in La Clery. Named after Tafari Charlemange, the well known footballer from the community who died after residents say he received an electric shock while trying to build a shelter in the community to live in, the association has blamed the lack of affordable housing in the country for his demise. “He was a talented young leader from the La Clery CDC community. He met his premature death while trying to achieve a basic human need – shelter,” the association said in a statement to St Lucia Times. The statement noted that Tafari Charlemange grew up in the derelict La Clery CDC buildings and the Ministry of Housing, Urban Renewal and Telecommunication wants to bulldoze the remaining structures, if the community stays idle. The association has launched a petition to halt the demolition. The petition, which is also being launched online, calls on the authorities to stop the demolition of the La Clery CDC community shelters since it will result in the dislocation, marginalization and social exclusion of a ‘historic community’. “Instead, we call on the authorities to engage and empower the community’s housing association in the process of regenerating and developing the community,” the petition states. I hope provisions for the less fortunate who live there will be made.